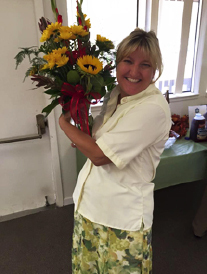 Pastor Trudy Franzen was born in Orange, CA and was baptized as in infant in the United Methodist Church. She grew up in various non-denominational churches and met her husband, Gary, on a contemporary Christian music tour. Trudy and Gary love to sing together and have always valued music in the church. Growing up white, middle class, Trudy’s family never had much money, but always valued hard work, education and frugality. 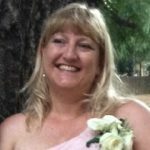 She went to work as early as she could, and eventually studied Spanish and Flute Performance at California State University, Fresno, and taught Spanish, English, and English as a Second Language (ESL), grades 7-12. She saw teaching as both vocation and ministry. Trudy and Gary were very active in the ministry of Lord of Life Lutheran Church in Clovis. While at Lord of Life, their children Grace, John and Amy were baptized. Two critical times in particular, Trudy heard the strong direction of the Holy Spirit. The first time, she was a young teacher and felt the Spirit directing her to adopt two Mexican teenage girls, Nency and Nereida. Trudy and Gary have enjoyed many joyful years with their girls, who live in Fresno with their extended families. The second critical time, Trudy was pregnant with her third baby. Like Samuel in the scriptures, she heard God calling her in the night. Trudy felt a strong direction to go into the ministry. 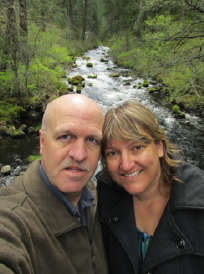 Trudy and Gary moved to Sacramento for Gary’s work, and Trudy was able to attend classes at Pacific Lutheran Theological Seminary. She saw her dual vocation and ministry as mother and pastor, so she chose to study part time. 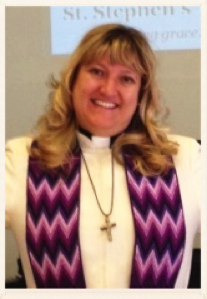 In 2007, Trudy was ordained a pastor and began to serve at American Lutheran Church and St. Luke’s Episcopal Church in Woodland, CA. She also served as Interim Pastor for Spanish Speaking Ministry at St. John’s Lutheran Church in Sacramento and has experience with homelessness ministry. Trudy came to serve St. Stephen’s Lutheran Church in the winter of 2013. She is also a Certified Clinical Hypnotherapist. Trudy values the call of the church to work for the good of those in the margins. At any given time, the margins include the disabled, the mentally ill, GLBTQ folk, the elderly, the homeless, the immigrant, and the otherwise rejected. She has always been attracted to the work of Non-Violence, Social Justice and Spiritual healing. 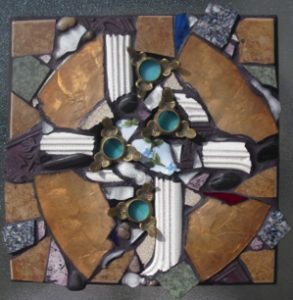 Trudy loves gardening, mosaic art, music, spirituality, and creativity. There are no people to show.